As the known purveyors of Total Death, VAULT OF DRIED BONES inaugurates their first complete offering with Manipura Imperial Deathevokovil (Scriptures of Reversed Puraana Dharmurder) the initiatory full-length album from Sri Lankan terrorists GENOCIDE SHRINES. The bone-dust has settled from 2012’s Devanation Monumentemples EP and the slit throats are still hemorrhaging from the Mahabharat Terror Attack split with countrymen Manifestor, but the anti-Dharmic death call has been issued once again for there are still skulls to be crushed! A line has been drawn in the sand. Choose your allegiance carefully. For GENOCIDE SHRINES are a piercing trishul thrust into the heart of the dogmatic weakling. A burning hatred guides the striking blow at the golden tower looming overhead. There is no time for over-wrought melodies or wheel-reinventing complexity when a cleansing eradication is the modus operandi. Whether it be by spiritual fire or firing squad – the message is clear: Fall in line or suffer at the hands of the reclaimers! 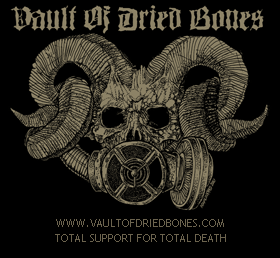 Cassette and CD releases by Vault Of Dried Bones January 2015ce. LP release by Vault Of Dried Bones and Iron Bonehead Productions early 2015ce. Cover illustration by Joel Santiago. This entry was posted in News and tagged deathevokovil, deathmetal, genocide, genocideshrines, imperial, manipura, shrines, totaldeath, vaultofdriedbones. Bookmark the permalink.